SeaWorld strives to inspire guests to protect animals and the wild wonders of our world. That’s why a percentage of your event revenue with us goes directly to the SeaWorld Busch Gardens Conservation Fund. This is also where exhilarating coasters, up-close animal encounters, and incredible culinary creations combine to make your event a memory that will last a lifetime. Conveniently located just one mile from the Orange County Convention Center, SeaWorld is the only theme park in the I-Drive Convention Center District. And all of our parks, including SeaWorld, Discovery Cove® and Aquatica, SeaWorld’s Waterpark™, offer tropical settings and the exclusivity of a private island. 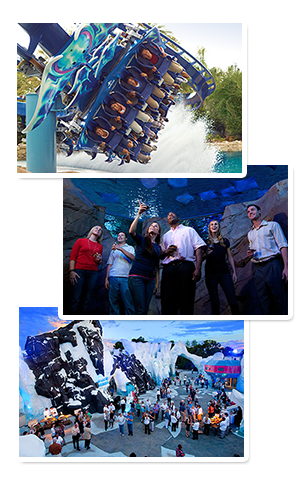 Whether your guests want to experience SeaWorld’s newest realm and ride Mako - Orlando’s tallest, fastest and longest coaster, see penguins up-close at Antarctica: Empire of the Penguin™ or network on the white, sandy beaches of Discovery Cove; it will be an immersive delight for the senses that will have your group singing its praises all the way back to the office and beyond.